For the 24 hours to 23:00 GMT, the GBP rose 0.48% against the USD and closed at 1.3109, amid reports that Britain and the European Union had made progress on the Irish border question, a major obstacle to agreeing a Brexit deal. Yesterday, the Bank of England (BoE), in its latest monetary policy meeting unanimously voted to keep its key interest rates steady at 0.75%, as widely expected and maintained its asset purchase at £435.0 billion. Further, the members raised their growth outlook for the third quarter to 0.5% from 0.4%, but warned that uncertainty on Brexit could influence household and business spending in the future. Meanwhile, the central bank reiterated that further rate hikes would be gradual and to a limited extent. In the Asian session, at GMT0300, the pair is trading at 1.3114, with the GBP trading a tad higher against the USD from yesterday’s close. 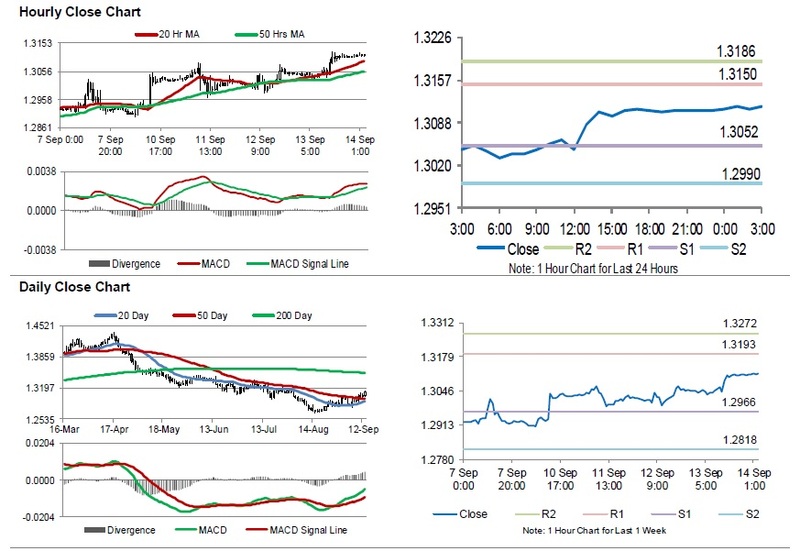 The pair is expected to find support at 1.3052, and a fall through could take it to the next support level of 1.2990. The pair is expected to find its first resistance at 1.3150, and a rise through could take it to the next resistance level of 1.3186. Moving ahead, investors would keep an eye on the BoE Governor, Mark Carney’s speech, due in a few hours.